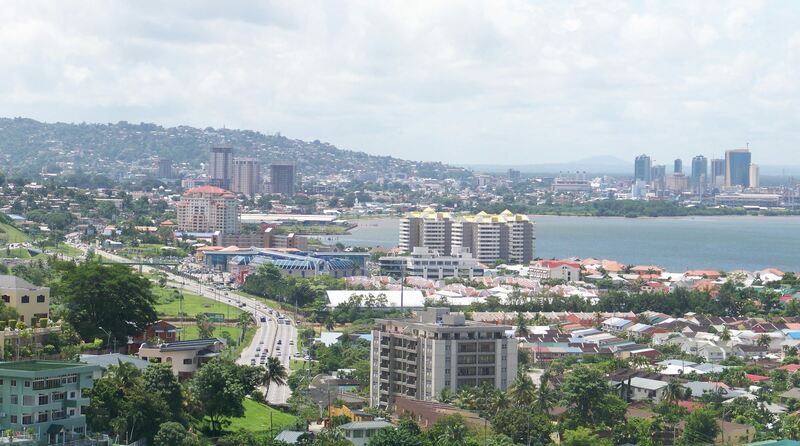 Port of Spain, the capital of Trinidad and Tobago sustained damage in yesterday’s M=7.3 earthquake in northeastern Venezuela. Yesterday, at just past 9:30 p.m. local time, a M=7.3 earthquake struck the northeastern coast of Venezuela. Fortunately, this quake occurred in a relatively remote area, and there are no reported deaths as of this morning. However, there is damage from the quake, including in Caracas, Venezuela’s capital, nearly 600 km (370 mi) away. Even though only light shaking was recorded in Caracas, according to the USGS ShakeMap, it was great enough to cause the top ten floors of an abandoned skyscraper to shift and lean precariously over the road far below. According to CNN, that area has been evacuated. Closer to the epicenter, in places such as Port of Spain, Trinidad and Tobago, additional structural damage has been observed in buildings. This Temblor map shows the location of yesterday’s earthquake in northeastern Venezuela. Also visible on the left and right sides of the map respectively are Venezuela’s capital city of Caracas and Trinidad and Tobago’s capital Port of Spain. While seismic activity is not uncommon in this region, yesterday’s M=7.3 quake is much deeper, and had different motion than the majority of quakes that impact Venezuela. Northern Venezuela is marked by the boundary between the South American and Caribbean plates. In this location, plate motion is approximately 20 mm/yr, and typically results in right-lateral strike-slip earthquakes at shallow depths. However, yesterday’s earthquake was compressional in nature, and occurred at a depth of 123 km. Therefore, it did not occur on the plate boundary, but rather well beneath it. Even though much of the seismicity in the region is dominated by the strike-slip plate boundary, the region is also subject to compression and some believe that off the northeastern coast of Venezuela there is an ancient, or not fully-formed subduction zone (Pindell et al., 2015). This zone, which Pindell et al. term the Proto-Caribbean Inversion Zone has the same rough orientation as the strike of yesterday’s earthquake. So, it at least seems possible that the event occurred on this structure, which could pose additional hazards for Venezuela and the southeastern Caribbean. Regardless of what structure yesterday’s earthquake occurred on, what this event highlights is the seismic hazard of the region. This illustrates both that large earthquakes are possible, and that even weak to light shaking can cause significant damage to buildings not of the highest build quality, as was seen in Caracas. Therefore, it is not only important to know the seismic hazard of where you live, but whether or not your home or office is capable of withstanding shaking. This photo shows a large crack that recently appeared in the East African Rift Valley. The crack, which is up to 50 feet deep and 65 feet wide significantly damaged a major road and destroyed homes. No image credit. 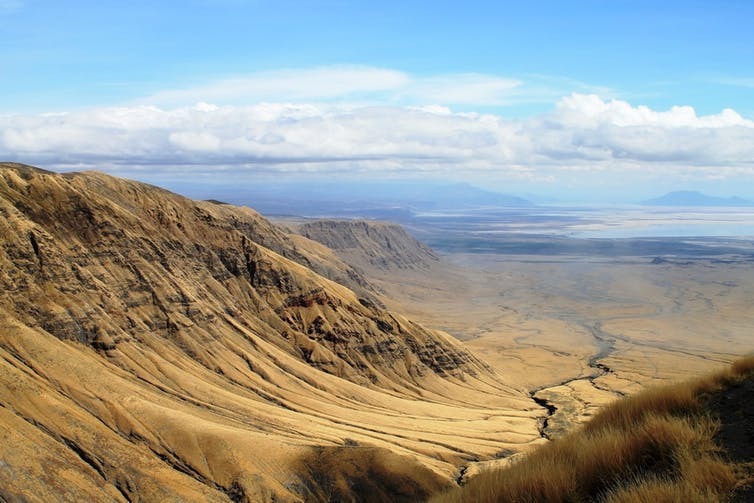 The East African Rift Valley is one of the most famous geologic regions on earth. Stretching for over 3,000 km from the Gulf of Aden in the north to Mozambique in the south, it marks where the African continent is being split into the Somali and Nubian plates. 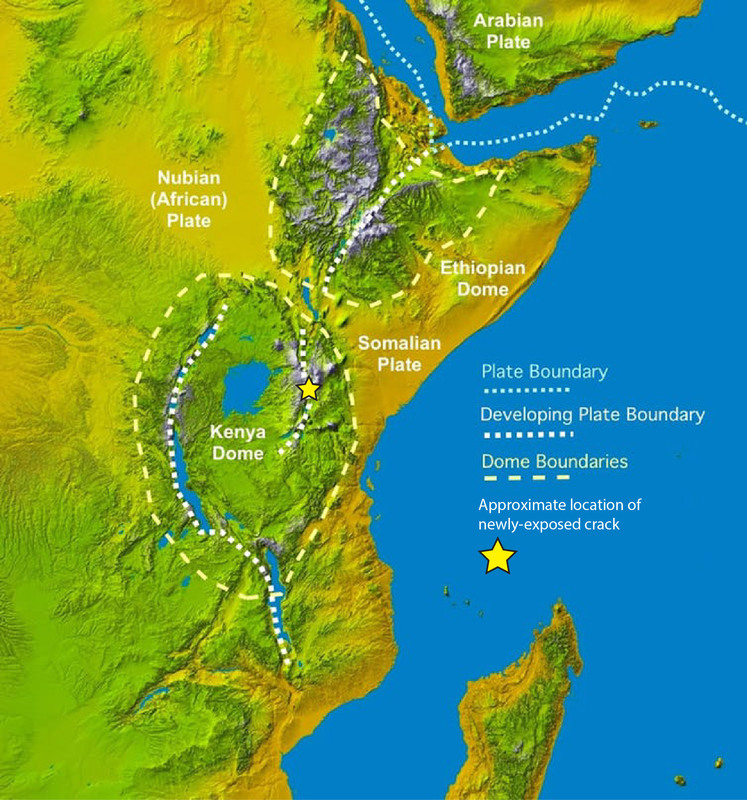 Scientists estimate that within 10 million years, the Somali plate will break off from the rest of Africa and a new ocean basin will form. Even though this is an extremely slow process, every once in a while, new crevices appear, highlighting the power of earth’s tectonic forces. 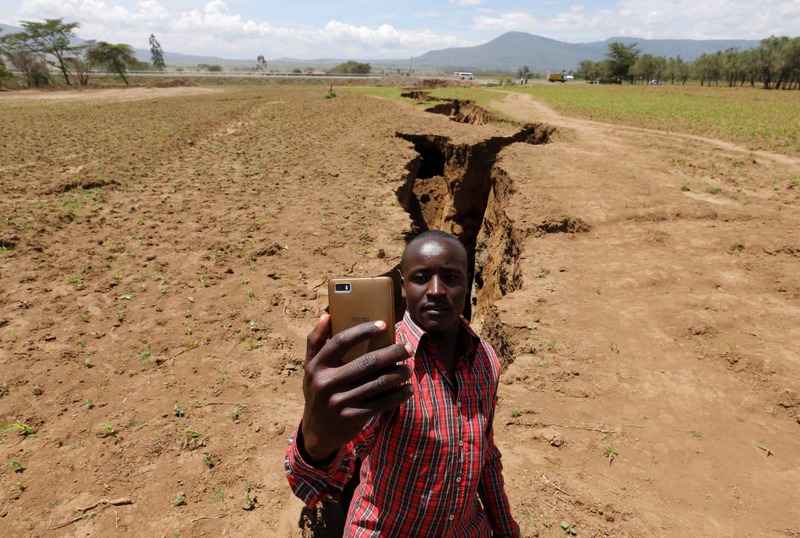 Only recently, near the small town of Mai Mahiu, just west of Kenya’s capital of Nairobi, a large crack, 50 feet deep and 65 feet wide appeared, damaging a major road, and several houses. A crack of this magnitude does not form overnight. The rifting process in East Africa is taking place at a rate of approximately 0.25 inches per year, or in other words, unnoticeable to most. We also know from aerial imagery that this feature was present prior to this massive unveiling. In the Google Earth image below, a large linear feature, perfectly matching the orientation of the crack in the photo above, is clearly visible cutting across the landscape. So, what happened to make the crack appear all of a sudden? The answer is simple: rain. 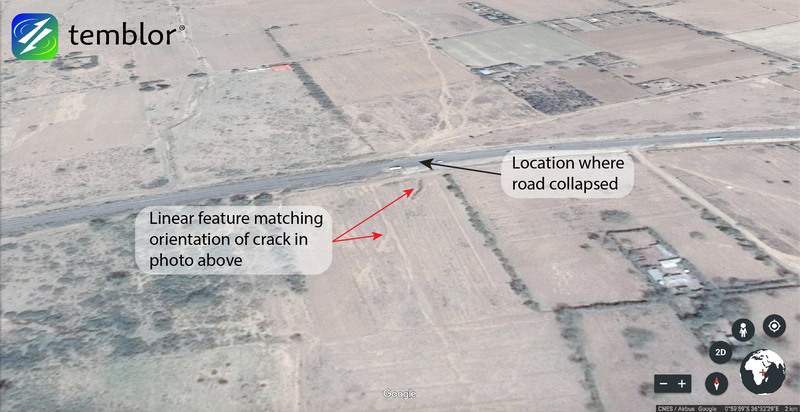 This Google Earth image shows the location of the collapsed road near the town of Mai Mahiu, just east of Nairobi. This photo also appears to show evidence of the crack, which is pointed out by the red arrows. The linear feature appears to match the orientation of the crack in the photo above. Over the last month, Kenya has experienced heavy rainfall, which has resulted in extensive flooding across much of East Africa. While flooding alone would not do this, much of the soil has volcanic ash from nearby Mt. Longonot (see below). Volcanic ash can be easily washed away, meaning when heavy rain came, the water followed the path of least resistance, revealing this crevice. According to reports from National Geographic, at least one resident narrowly escaped his house before it collapsed. 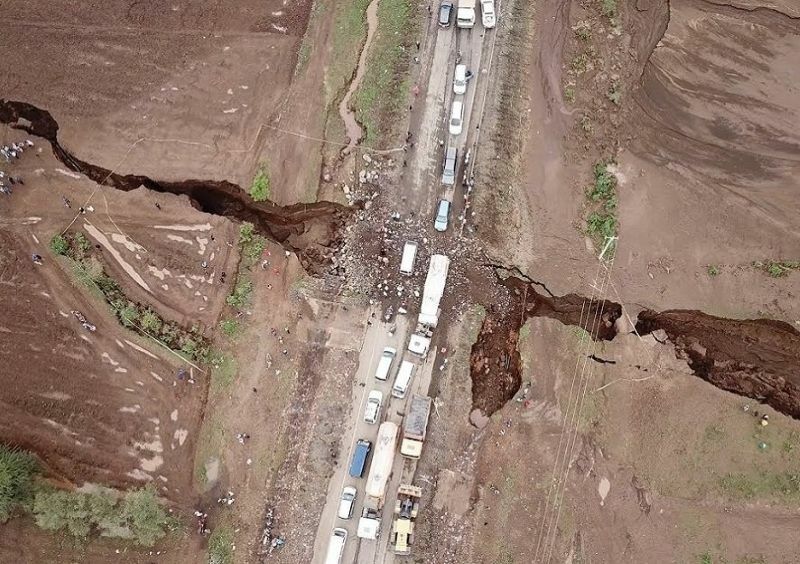 For the time being, local news outlets are reporting that the crack is being filled in with concrete and rocks, as the Mai Mahiu-Narok road is a major transportation route in Kenya. Earth’s tectonic plates are constantly in motion. As these plates move, they can slide next one another, like the San Andreas Fault, collide with one another forming mountain ranges like the Himalayas, or move apart from each other, which is what is happening in East Africa. As the Somali plate slowly separates from the Nubian plate, the earth’s crust gets thinner. Even though this process is slow, eventually the crust gets too thin and ruptures, creating a rift valley. This is the first step in the continental breakup process. The figure below shows these plate boundaries in East Africa and highlight where Africa is breaking apart, illustrating where a new ocean basin may form. While we will not be around to see that, we can bear witness to some of the initial stages. It looks like Mt Aso’s magma chamber stifled part of the magnitude-7.1 Kumamoto earthquake in April, but that stress might boost its activity, seismologists warn. When an earthquake tore down a fault line in Japan in April this year, its destructive course may have been halted early thanks to a crater beneath a nearby volcano. A day after the magnitude-7.1 Kumamoto earthquake struck Kyushu Island in southwest Japan, Japanese seismologists, led by Aiming Lin of Kyoto University, headed into the field to investigate its passage. According to their paper published in Science today, the quake had torn through 40 kilometres of earth along the Hinagu–Futagawa Fault Zone, as well as a series of newly discovered faults, in close proximity to nearby Mt Aso – one of the world’s largest active volcanoes. Although experts know there’s a relationship between volcano and earthquake activity, it’s a tricky interaction to study because examples don’t come up too often. The proximity of this quake to Mt Aso presented a rare opportunity. The researchers identified new faultlines cut into a 380-kilometre-wide crater that forms part of Mt Aso. Interestingly, the rupture that cut into the volcanic crater – also known as a caldera – terminated suddenly. The cause of this interruption, the researchers suggest, was the magma chamber under the volcanic crater around three kilometres beneath the Aso caldera. At the depth of the magma chamber, around six kilometres below the crater, the quake’s ruptures ceased, probably because the magma chamber’s extreme temperature (around 580 °C) sent the seismic pressure upwards instead of continuing its path. “Magma is fluid so it absorbs stress,” says Lin. This change in pressure direction created a new series of stress fields beneath the active volcano. 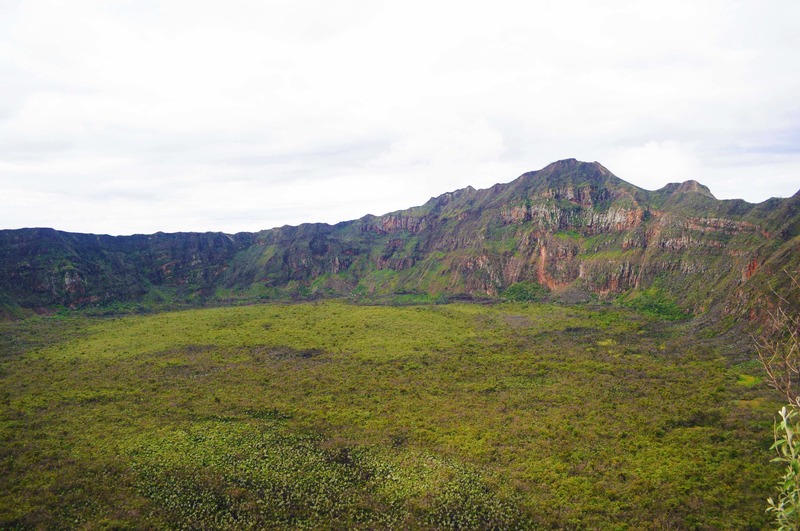 Importantly, the researchers suggest the new ruptures under the caldera could potentially trigger an eruption of Mt Aso in the near future and they urge experts keep a close eye on its activity. 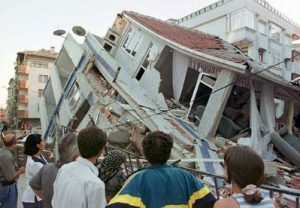 When a strong earthquake hits an urban area, prompt rescue operations can minimize the number of victims. Logically, the probability of saving a human trapped under debris or injured during the course of a disaster decreases exponentially as function of time, vanishing almost completely after about few hours. The Tokyo Fire Fighting Department Planning Section  has quantified this further, stating that rescue within 3 hours is desirable and survival rate is drastically lower after 72 hours. Past disasters—like the magnitude 6.6 quake that struck Iran on 26 December 2003—support this assessment. As a result of that earthquake, more than 43,000 people died, and only 30 were saved, despite the intervention of 1600 rescuers from 43 nations. This tragic outcome is likely related to the fact that many rescuers didn’t arrive until after 3 days. The impact of a strong earthquake on an urban center can be considerably reduced by an efficient emergency management center, through timely and targeted actions immediately following the quake. A real-time urban seismic network—sensors laid out in a grid through a city—could help emergency management centers by providing immediate alert and postearthquake information summarized in maps of ground motion. Researchers are using new technological advances to develop one such urban seismic network in Acireale, Italy. The network will not use traditional seismometers; rather, they will harness the less expensive technology of accelerometers. An accelerometer designed by the Archimedes Automated Assembly Planning Project at Sandia National Laboratory. Once operational, it will be the first urban seismic network in Europe. Urban seismic networks allow the disaster’s first responders to manage available resources, such as personnel and equipment needed to rescue people. Rescue operations and verification of damage to buildings could then be carried out according to a logical priority according to where the highest shaking was measured by the seismic network. Such an approach would minimize secondary effects induced by an earthquake and allow officials to protect critical infrastructure, thereby mitigating the economic and social costs of the earthquake. The high costs associated with the construction and installation of traditional seismic stations has made it nearly impossible to realize a true seismic network on an urban scale. However, recent technological developments in the field of microelectromechanical systems (MEMS) sensors, which can be configured to detect minute accelerations, may allow scientists to create an urban seismic network at low cost. The internal devices that will constitute the MEMS accelerometric stations: the sensor, single-board computer, and GPS are manufactured by Phidgets Inc.
MEMS sensors are a set of highly miniaturized devices that receive information from the environment and translate physical quantities they sense into electrical impulses. Depending on how the sensors are configured, they can measure phenomena of various kinds: mechanical (sound, acceleration, and pressure), thermal (temperature and heat flux), biological (cell potential), chemical (pH), optical (intensity of light radiation and spectroscopy), and magnetic (intensity of flow). The MEMS devices that will be used in the project integrate a three-axis accelerometer, which can measure both constant accelerations (usable as a tilt sensor) and those that vary in time (used to measure the oscillation induced by an earthquake). In the 1990s, MEMS sensors revolutionized the automotive airbag system and are today widely used in laptops, games controllers, drones, and mobile phones. When configured to measure ground shaking, the sensitivity and the dynamic range of these sensors are high enough to allow the researchers to record earthquakes of moderate magnitude even at a distance of several tens of kilometers [D’Alessandro and D’Anna, 2003; Evans et al., 2014]. Because of their low cost and their small size, MEMS accelerometers could be easily installed in urban areas to achieve a seismic network with a high density of measuring points. In the past decade, a number of research institutes that focus on geophysics and seismology have shown interest in this promising technology. In California and Japan, scientists are developing networks consisting entirely of MEMS sensors. These include the Quake-Catcher Network, managed by Stanford University [Cochran et al., 2009; Chung et al., 2011; Kohler et al., 2013]; the Community Seismic Network, managed by the California Institute of Technology [Clayton et al., 2011; Kohler et al., 2013]; and the Home Seismometer Network, managed by the Japan Meteorological Agency [Horiuchi et al., 2009]. In September 2015, the Italian Ministry of Education, University and Research funded a 3-year project to create the first European urban seismic network using MEMS technology. 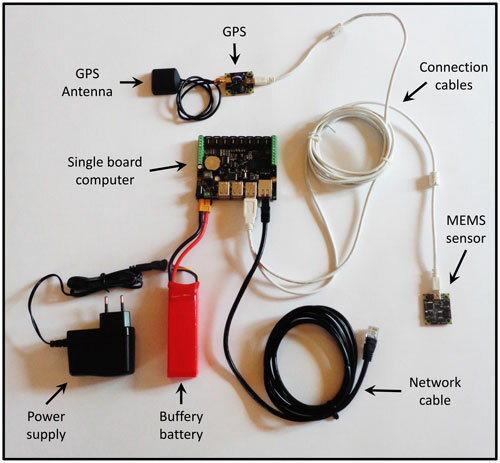 The project is called Monitoring of Earthquakes through MEMS Sensors (MEMS project). We chose the municipality of Acireale, Italy, an urban area particularly vulnerable to earthquake hazards [Azzaro et al., 2010, 2013], as a pilot site for the MEMS project. Acireale is located on the southeastern slopes of Sicily’s Etna volcano and is vulnerable to damage from tectonic and volcanic earthquakes. 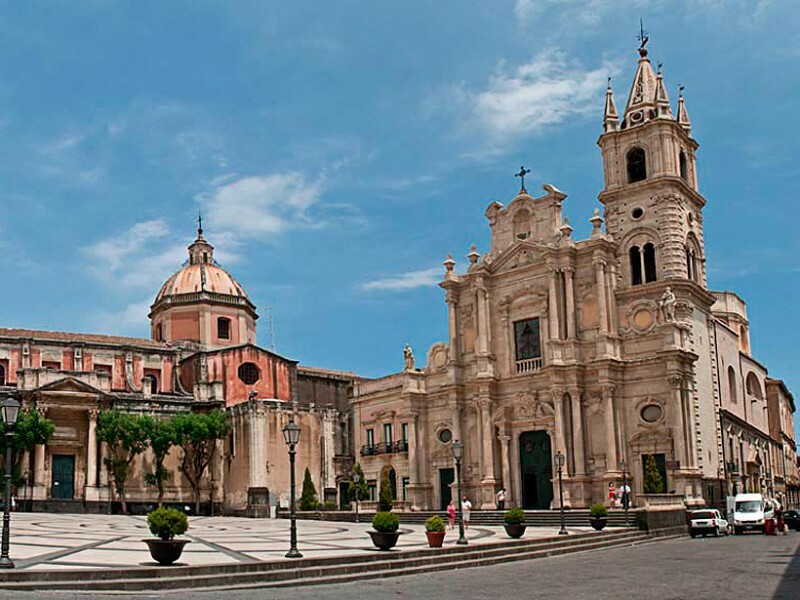 Founded in the 14th century, Acireale contains many seismically vulnerable buildings of historical and cultural value. In the past 2 centuries, more than 190 damaging earthquakes have occurred in the Etna region, almost 1 per year. This includes an earthquake sequence that began with a main shock on 29 October 2002—following this magnitude 4.4 event, more than 400 buildings in Acireale were declared uninhabitable [Azzaro et al., 2010]. We aim to develop an urban seismic network comprising about 200 MEMS stations. Each station will consist of a three-axis digital MEMS accelerometer connected to a computer for on-site signals preprocessing. Each station will be supplied with a GPS for time synchronization and an Internet connection for data transmission to a processing center. Should an earthquake cause a power outage, the station can function autonomously for about 2 hours. The MEMS stations will be located mainly inside buildings characterized by high vulnerability (old buildings that weren’t built to withstand high shaking) and high flux of people moving in and out, such as schools, hospitals, public buildings, and places of worship. The geometry of the network will be designed to create homogeneous coverage of the urban center, with a high enough density of stations in the vicinity of the well-known faults. The network’s success will depend on our ability to implement algorithms able to prevent false alarms. Such algorithms will allow the creation of a shaking map only if a significant percentage of the MEMS stations have simultaneously detected a shaking event—if shaking is human made (e.g., an explosion), only the nearest stations would detect it, but an earthquake would be recorded by many stations. Automatic detection of patterns in waveforms that signal a specific seismic source will also be helpful. If all goes well, the network will be operational by the end of 2017. The seismic waveforms captured by the sensors will be processed in real time to identify several shaking parameters that will be used to create shake maps at the urban scale. 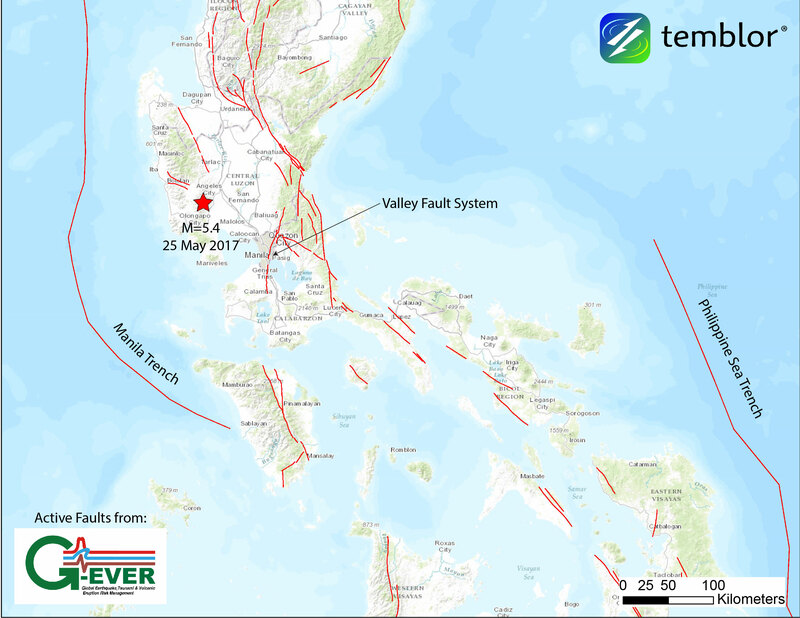 The earthquake waveforms collected by the network will also be used to reconstruct the movement along the faults that caused the earthquakes to map seismic hazards and risks on a fine scale for the area covered. The system could be used to implement a site-specific earthquake early warning system [Horiuchi et al., 2009]. Such a system could enhance the safety margin of specific critical engineered systems—such as energy plants or high-speed railway networks—in real time, mitigating the seismic risk by triggering automatic actions that aim to shelter people from exposure to shaking. If successful, the MEMS project could provide a useful tool to reduce the seismic risk by increasing the safety of the population of the urban area covered by the network. Such a system could be quickly extended to other areas of high seismic risk, revolutionizing how communities monitor earthquakes. Communities would no longer need to focus on the characterization of earthquakes in terms of focus parameters (e.g., hypocenter and magnitude). Instead, networks like the MEMS project would characterize shaking by direct measurements of how shaking affects a city, neighborhood by neighborhood. Azzaro, R., C. F. Carocci, M. Maugeri, and A. Torrisi (2010), Microzonazione sismica del versante orientale dell’Etna: Studi di primo livello, report, 184 pp., Le Nove Muse Editrice, Rome. 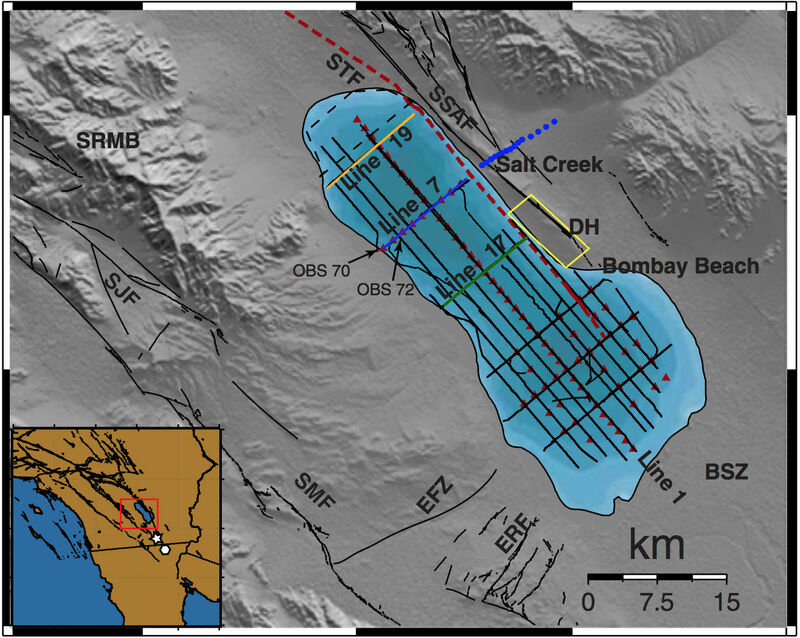 Azzaro, R., S. D’Amico, L. Peruzza, and T. Tuvè (2013), Probabilistic seismic hazard at Mt. Etna (Italy): The contribution of local fault activity in mid-term assessment, J. Volcanol. Geotherm. Res., 251, 158–169, doi:10.1016/j.jvolgeores.2012.06.005. Chung, A. I., C. Neighbors, A. Belmonte, M. Miller, H. H. Sepulveda, C. Christensen, R. S. Jakka, E. S. Cochran, and J. F. Lawrence (2011), The Quake-Catcher Network rapid aftershock mobilization program following the 2010 M 8.8 Maule, Chile earthquake, Seismol. Res. Lett., 82(4), 526–532, doi:10.1785/gssrl.82.4.526. Clayton, R. W., et al. (2011). Community Seismic Network, Ann. Geophys., 54(6), 738–747, doi:10.4401/ag-5269. Cochran, E. S., J. F. Lawrence, C. Christensen, and R. S. Jakka (2009), The Quake-Catcher Network: Citizen science expanding seismic horizons, Seismol. Res. Lett., 80(1), 26–30, doi:10.1785/gssrl.80.1.26. D’Alessandro, A., and G. D’Anna (2003), Suitability of low cost 3 axes MEMS accelerometer in strong motion seismology: Tests on the LIS331DLH (iPhone) accelerometer, Bull. Seismol. Soc. Am., 103, 2906–2913, doi:10.1785/0120120287. Evans, J. R., R. M. Allen, A. I. Chung, E. S. Cochran, R. Guy, M. Hellweg, and J. F. Lawrence (2014), Performance of several low-cost accelerometers, Seismol. Res. Lett., 85, 147–158, doi:10.1785/0220130091. Horiuchi, S., Y. Horiuchi, S. Yamamoto, H. Nakamura, C. Wu, P. A. Rydelek, and M. Kachi (2009), Home seismometer for earthquake early warning, Geophys. Res. Lett., 36, L00B04, doi:10.1029/2008GL036572. Kohler, M. D., T. H. Heaton, and M.-H. Cheng (2013), The Community Seismic Network and Quake-Catcher Network: Enabling structural health monitoring through instrumentation by community participants, Proc. SPIE, 8692, 86923X, doi:10.1117/12.2010306. Tokyo Fire Fighting Department Planning Section (2002), New Fire Fighting Strategies, Tokyo Horei, Tokyo. Citation: D’Alessandro, A. (2016), Tiny accelerometers create Europe’s first urban seismic network, Eos, 97, doi:10.1029/2016EO048403. Published on 17 March 2016. Seismologists and app developers are shaking things up with a new app that transforms smartphones into personal earthquake detectors. 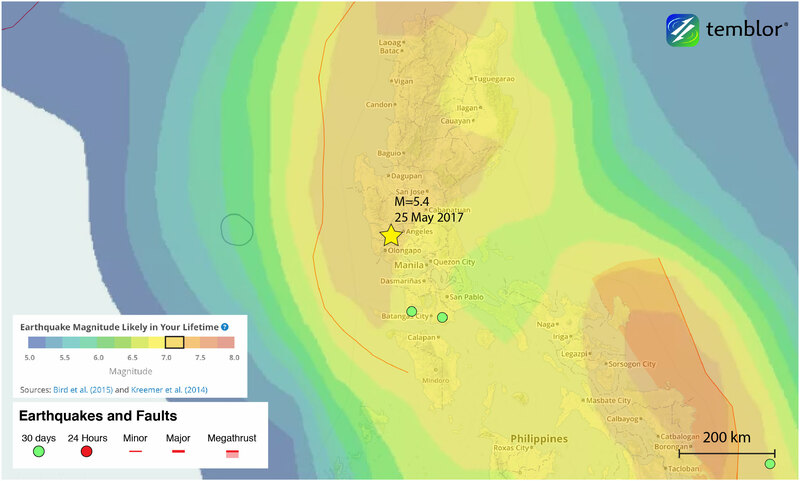 By tapping into a smartphone’s accelerometer — the motion-detection instrument — the free Android app, called MyShake, can pick up and interpret nearby quake activity, estimating the earthquake’s location and magnitude in real-time, and then relaying the information to a central database for seismologists to analyze. In time, an established network of users could enable MyShake to be used as an early- warning system, the researchers said. Seismic networks worldwide detect earthquakes and convey quake data to scientists around the clock, providing a global picture of the tremors that are part of Earth’s ongoing dynamic processes. But there are areas where the network is thin, which means researchers are missing pieces in the seismic puzzle. However, “citizen- scientists” with smartphones could fill those gaps, according to Richard Allen, leader of the MyShake project and director of the Berkeley Seismological Laboratory in California. “As smartphones became more popular and it became easier to write software that would run on smartphones, we realized that we had the potential to use the accelerometer that runs in every smartphone to record earthquakes,” Allen told Live Science. Accelerometers measure forces related to acceleration: vibration, tilt and movement, and also the static force of gravity’s pull. In smartphones, accelerometers detect changes in the device’s orientation, allowing the phone to know exactly which end is up and to adjust visual displays to correspond to the direction it’s facing. In fact, the earthquake-detection engine in MyShake is designed to recognize an earthquake’s vibration profile much like a fitness app recognizes steps, according to Allen. In other words, the difference between the highs and lows of the motion generated by an earthquake are smaller than the range you’d find in other types of daily movement, he said. 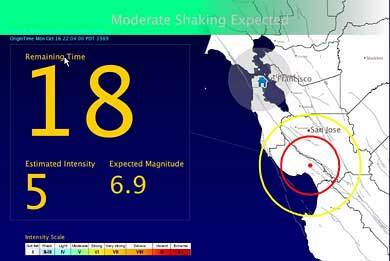 When a smartphone’s MyShake app detects an earthquake, it instantly sends an alert to a central processing site. A network detection algorithm is activated by incoming data from multiple phones in the same area, to “declare” an earthquake, identify its location and estimate its magnitude, Allen said. For now, the app will only collect and transmit data to the central processor. But the end goal, Allen said, is for future versions of the app to send warnings back to individual users. An iPhone version of the app will also be included in future plans for MyShake, according to Allen.For seismologists, the more data they can gather about earthquakes, the better, Allen said. A bigger data pool means an improved understanding of quake behavior, which could help experts design better early warning systems and safety protocols, things that are especially critical in urban areas prone to frequent quake activity. 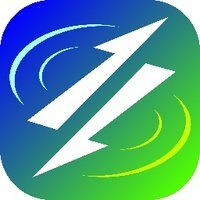 With 2.6 billion smartphones currently in circulation worldwide and an anticipated 6 billion by 2020, according to an Ericsson Mobility Report released in 2015, a global network of handheld seismic detectors could go a long way toward keeping people safe by improving quake preparation and response. The findings were published online today (Feb. 12) in the journal Science Advances, and the MyShake app is available for download at myshake.berkeley.edu.